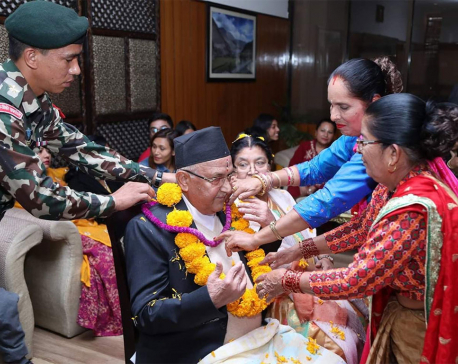 KATHMANDU, Nov 9: President Bidya Devi Bhandari offered the seven-coloured bhaitika to her younger brother Degendra Pandey at the auspicious hour of 11.55 am at the President House, Sheetal Niwas, today. 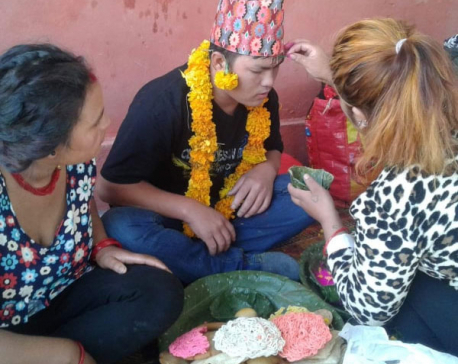 In a special ceremony held on the occasion of the Bhaitika festival, President Bhandari put the garland of dubo grass and makhamali flower around her brother’s neck as blessings. She also presented dry fruits and sweets to her brother. The President’s brother also presented gifts to her. Prior to this, President Bhandari performed the rituals of paying homage to the lamp, kalasha (the holy urn), Ganesha as well as the Ashtachiranjivi and the Yamayamuna deities as per the time-honoured tradition.